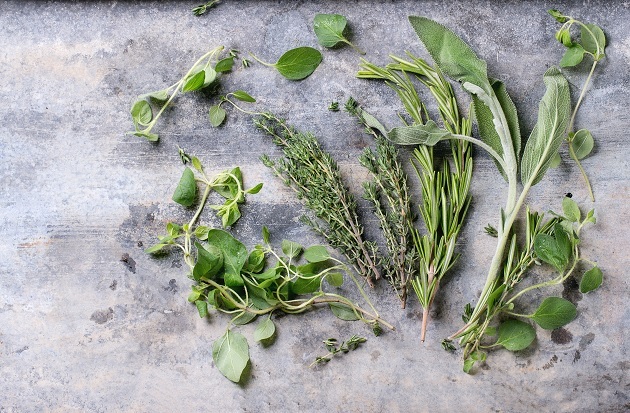 Fresh and dried herbs have the ability to transform your cooking. When used properly, they can elevate a dish and inject multiple levels of flavoring that will delight your palette. Rosemary is one of the most versatile herbs that you can incorporate into your dishes. With its myriad of health benefits and earthy taste, rosemary is a go-to seasoning for chefs and cooking enthusiasts everywhere. What Are Rosemary's Uses In Cooking? What's A Good Substitute For Rosemary? How Do I Store Fresh Rosemary? Rosemary comes from the Mediterranean. It's known as a perennial, or evergreen herb and when fresh it looks a lot like the branches of a fir tree. Like fir trees, rosemary plants tower over the landscape and when full grown can reach up to six feet tall. Rosemary is related to mint but its flavor is earthy with a touch of lemon. The lemony aftertaste means that it pairs well with citrus fruits and foods that call for lemon, like fish and chicken. Rosemary we get in the grocery store comes as stalk peppered with small, hardy green leaves that can be broken off and minced for cooking, or used in slow cooking dishes like roasts and soup bases for an injection of flavor. Some people like to infuse oils with rosemary for a sophisticated flavor. It has a long history of medicinal and ceremonial uses. Shakespeare famously mentioned it in some of his more well known tragic plays, like Romeo and Juliet and Othello. A cleansing herb, rosemary is traditionally thought of as being able to ward off evil or bad luck. Today, we are well aware of the medicinal properties and rosemary oil can be found at most health food stores alongside other natural remedies. Rosemary oil has been known to soothe pains and muscle aches so people suffering from chronic diseases like arthritis will often use it. It's also been linked to soothing headaches if applied to the temples. Rosemary is especially good for vegans and vegetarians because it provides them with the nutrients they're not getting from animal products. Rosemary has been known to aid digestion. It might even ward off mental aging and aid in concentration when consumed as part of a healthy diet. From homemade scrubs to hair enhancers, to oil infusions, rosemary has made its mark on the herbal health industry. There are plenty of resources where you can find DIY (do it yourself) that will leave you with glowing skin, beautiful tresses or callous-free feet! Add rosemary oil to your regular night cream for a soothing beauty boost that will leave you totally refreshed and feeling pampered. From the kitchen to your beauty cabinet, rosemary is a true star! Rosemary shines in the kitchen, where it's used to amplify recipes from barbecue sauce to bread goods to sweet desserts. Most spice blends contain at least some dried rosemary, and many recipes call for a spring or two. To prepare rosemary, simply chop the leaves and add them to a dish of your choice for a subtle earthy and lemony flavor. Rosemary pairs spectacularly with meat dishes like lamb, chicken, and beef as well as a variety of sauces. It can amplify a boring hollandaise or make macaroni and cheese gourmet. Add a tablespoon of fresh rosemary to canned tomato soup for a restaurant quality meal. Make a simple flatbread with flour, olive oil and water, then sprinkle liberally with sea salt and fresh rosemary for a homemade cracker. Rosemary is also the star of slow cooking. Put a spring in your crockpot to infuse any roast with an intoxicating flavor. 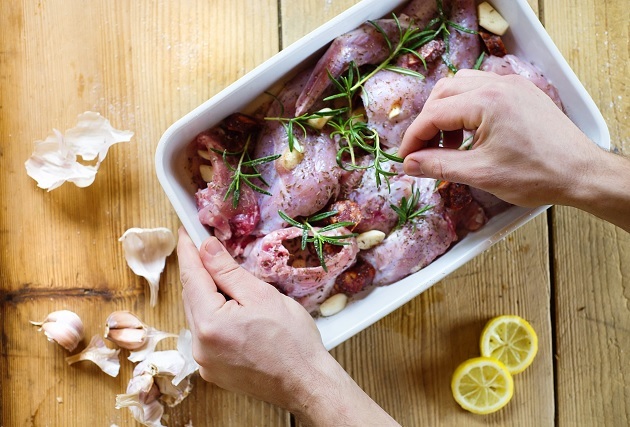 You can either remove and discard the spring when you're finished cooking or skim off the leaves, chop them and add them to the finished recipe. Make a rosemary compound butter by mixing it with softened butter for a unique spread. You can also freeze the butter and serve it cold over a hot roast! Create your own compound oil by combining rosemary with olive oil and letting it steep. You can use it on anything from stir-fries to grilled cheese sandwiches. Sprinkle some rosemary and basil on your morning scrambled eggs for an herby twist to die for. Poach your fish with a little rosemary and lemon. Add a rosemary spring to your soup base to boost flavor. Make store-bought biscuits better by working fresh rosemary into the dough before baking. Get creative! Bake your favorite fruits with a touch of rosemary and brown sugar for a dessert sure to please. Mix chickpeas, tahini, olive oil, garlic and finely chopped rosemary for a new twist on hummus. Combine with chopped cucumber, feta cheese, cherry tomatoes, black olives and a healthy dollop of olive oil for a Greek salad. Skewer your favorite vegetables on rosemary stalks for creative and attractive serving. Add a (small) touch of fresh rosemary to pie dough. This works especially well for lemon-based desserts but can also be used with rhubarb or even apple pies. Make a rosemary simple syrup to use in your favorite artisanal cocktails for an added oomph. There are plenty of where rosemary is the undisputed star. You can also experiment with it on your own for a refreshing take on your traditional recipes. Don't forget dessert either! Rosemary pairs well with fresh, baked or canned fruits and will be a novel approach to a sweet finish for your meal. 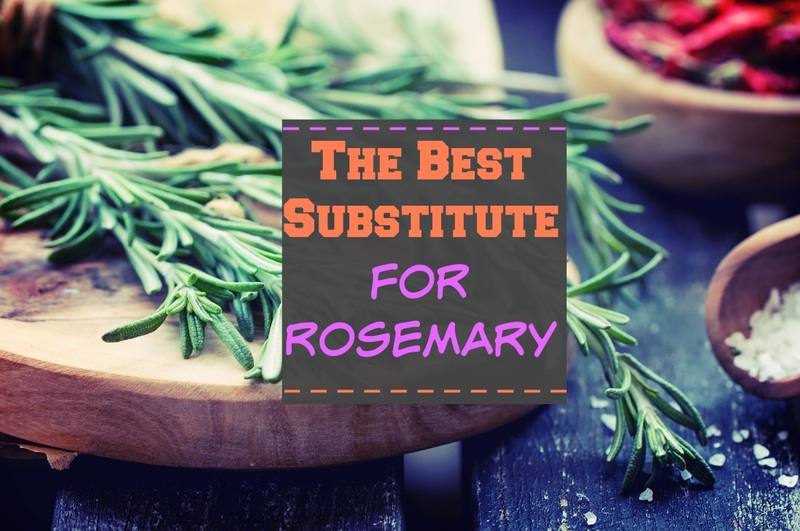 Rosemary's versatility means that it can be swapped out for other herbs if need be. It plays well with others and is incorporated into lots of spice blends, so you'll be able to mix the flavors harmoniously without a problem. Fresh and dried rosemary have slightly different flavor profiles and it's important to keep in mind that dried herbs will have much more potency than fresh ones, so substitute accordingly and with the proper measurements. Adding too much of any herb to a recipe will spell disaster and render your food inedible. Here are just a few substitutions for fresh rosemary. It's important to keep in mind what you're cooking also. For example, a fresh peach dish would pair really well with peppermint, whereas a roast rack of lamb would work with fresh thyme. You can swap out dried rosemary for any of the dried herbs above. Bay leaf also often comes only in dried form, so this might be your only option! Here are a few more substitutions for dried rosemary. As always, bear in mind what you're cooking and what your ultimate flavor profile objective is! Feel free to customize or experiment to suit your own tastes and don't be afraid to push the envelope a little bit! Dried rosemary has a long shelf life and will retain its potency for months, but fresh rosemary must be used quickly. If you find yourself in a situation where you have an excess, consider it a lucky accident! You can always make a rosemary oil, compound butter, or saute up some quick vegetables. If you want to save your rosemary for another day, read below to discover how you can properly store it. Make sure your rosemary is sealed properly in an airtight plastic bag and put it in either the crisper section or a colder area of your refrigerator. It's really important for your rosemary to be stored in a very cold place, or else it will spoil quickly. If stored properly, rosemary will stay good for up to two weeks. If you can't use your fresh rosemary within that time period, read on to learn how you can freeze it for months of use. Use to store fresh rosemary so it lasts for months. Make sure the bags are closed properly so the herb doesn't get freezer burn. If it does, you'll have to throw it out. You can also chop up rosemary, combine it with oil and freeze it in ice cube trays for a jolt of flavor whenever you want one. Just make sure you don't accidentally pop a rosemary cube in your drink! If you have an herb blend that you really like, feel free to whiz together rosemary and complimentary herbs in a food processor and save the pulp in airtight freezer bags for a ready-made flavor base. Rosemary is endlessly versatile and its uses range from the medicinal to the culinary. You can use a finely minced handful in your favorite body scrub, rub rosemary oil on your aching joints or use it in a number of delightful ways in your cooking! Rosemary is full of iron, calcium and vitamin B-6, making it an herb you want to incorporate into your diet. It can be used in a host of DIY beauty products. Rosemary shines in the kitchen where it pairs wonderfully with chicken, roasts, biscuits, fish and even pie crust! It can be used to elevate canned and frozen food. It can be swapped out for a number of different herbs. Always keep in mind that dried rosemary is much more potent than fresh. Rosemary (fresh) can be stored in the refrigerator for up to two weeks and the freezer for months.